11 min video featuring Roy (Jason Part V) demolishing some offline bots in Friday the 13th: The Game for PS4. Alternative to long live-stream. 11 min video featuring Roy (Jason Part V) demolishing some offline bots in Friday the 13th: The Game for PS4. Roy’s here! 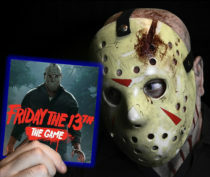 Imposter Jason from Friday the 13th Part V: A New Beginning has just been added to Friday the 13th: The Game. Check out the stream that aired right after the update went live for an in-depth look at the “Blue Bomber” as well as the new balancing changes. First look at the return of Shelly! Larry Zerner reprises the role that made him a staple of the slasher genre in Friday the 13th Part 3. Providing the voice for the video game incarnation, Shelly has come back to life for fans of the franchise to enjoy (and hack to death)! First look at the long-awaited offline bots in Friday the 13th: The Game. Single player not far off! Here is your 2017 countdown to the most wonderful time of the year! Autumn is coming! Another endless sauna, another countdown! Seems like every summer is worse than the last. The current stretch of days where the heat index surpasses 100° is like the front row seat in Hell that I never asked for. I miss walking in my favorite cemetery at night. I miss hiking through the woods and making outdoor videos. As I sit here and reminisce I’m reminded that relief isn’t too far off. Sitting right at 60 days at the time of publishing, Autumn is like a lone glimmer of light glistening in the distance as we mercilessly navigate a raging sea of black fire and hazy misery. The sun, or cancer ball as I’ve recently named it, looms overhead like an angry god punishing all the puny life below with furious vengeance. Only the Autumnal Equinox can save us. Just like last year, that first 65° day will probably see me tearing my own shirt off and looking to the skies above in total euphoria. It can’t get here a moment too soon. Clean air, crunchy leaves, beautiful colors, cool breeze, and Halloween! I need it! All of it! Get here! NOW!